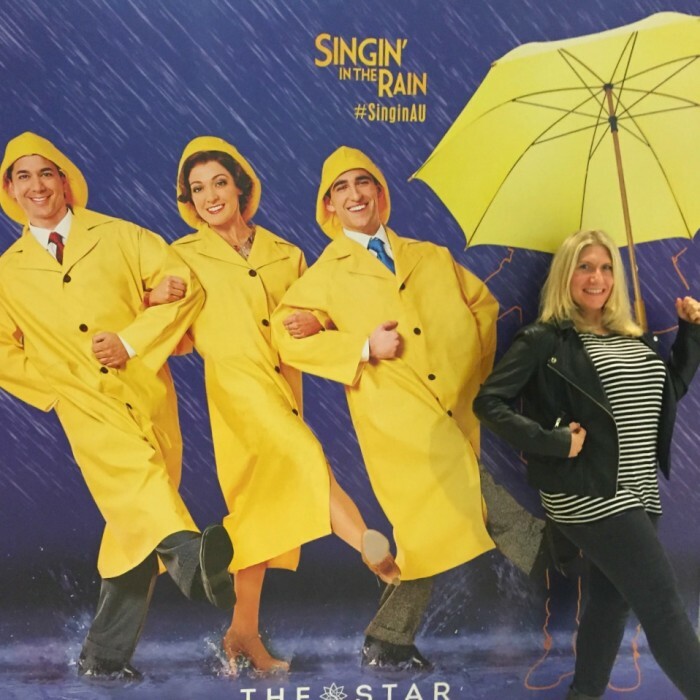 Grab your brolly and get your gumboots on because there is a new musical taking Sydney by storm! 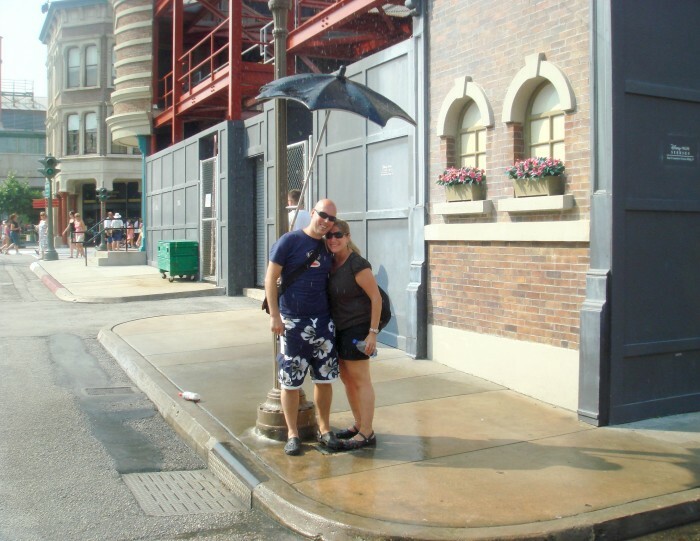 The closest I ever got to seeing Singin’ in the Rain was seeing the street from the movie set at Walt Disney World’s Hollywood Studios on honeymoon way back in 2007. As you can see, we weren’t singing, it wasn’t raining and it was surprising we didn’t get arrested by the Fashion Police. 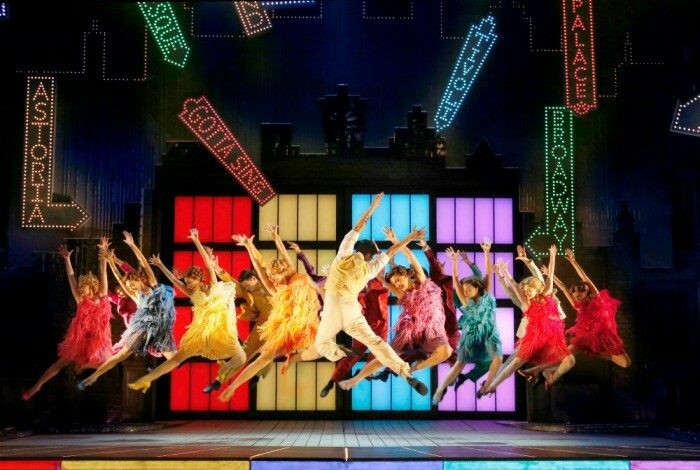 Anyhoo, since then not only has our fashion sense improved but this splash hit musical has taken to the stage, with a sell out season at London’s Palace Theatre, a UK national tour, four Olivier (the Oscars of the London stage) award nominations and now the show is making a splash down under. Right now, it’s right here in Sydney at the Lyric Theatre. Cue excitement PLUS! I am so excited, I could twirl my brolly! It’s not every day it’s your birthday and it’s not every day a new musical comes to town so when I found out “Singin’ in the Rain” was on stage, and my birthday was a-coming, I was there quicker than you can say “raining cats and dogs” or “raining kangaroos and koalas” as I like to say now that I am a real Australian. 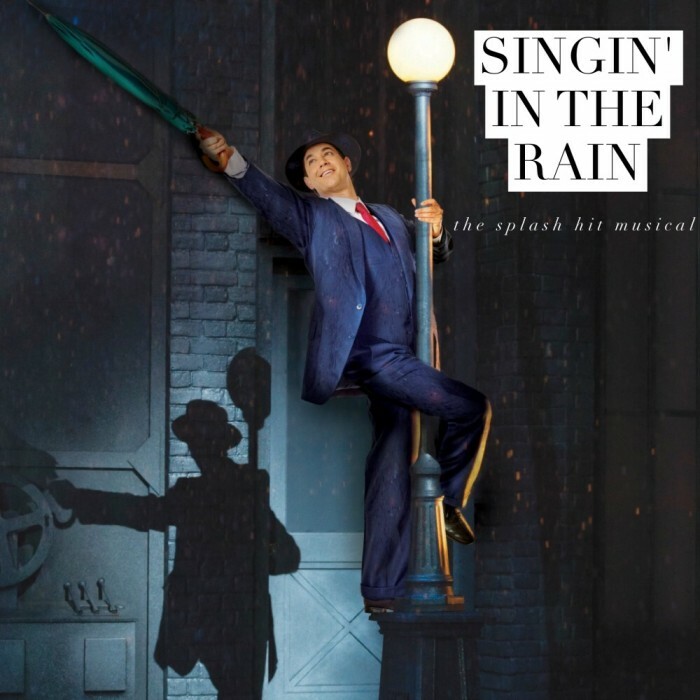 I couldn’t think of a more appropriately named musical because Sydney has been seriously soggy in recent days. 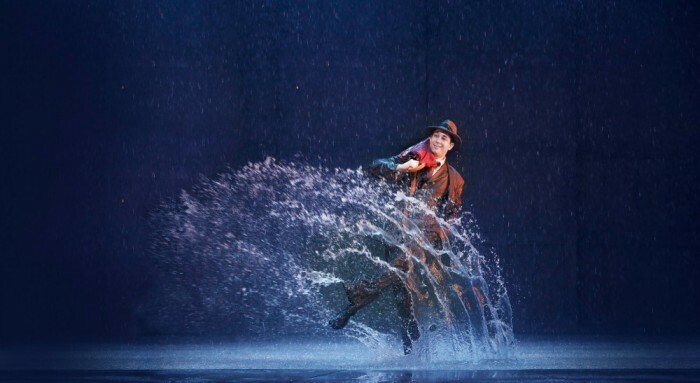 Some say that “Singin’ in the Rain” is the best musical movie ever made and this all singing and all dancing stage extravaganza has been showered with praise too. Not only does it stick closely to the plot of the movie, the show is jam packed full of Hollywood glitz, glamour, romance and lots of laughs! It’s quite spectacular! Now every good Hollywood love story has a leading man and this one is no exception. After judging on “Dancing with the Stars”, appearing in a whole heap of West End musicals and being nominated for so many Olivier awards, Adam Garcia is a making a welcome comeback to the Australian stage as Don Lockwood. The night I went he hadn’t quite come back yet, and Grant Almirall was filling his shoes but he was tap-tastic too! Of course, every leading man needs a good sidekick, even when they’re dancing in the rain. As a fan of “So You Think You Can Dance”, I was thrilled to see Jack Chambers (winner of the first ever Aussie series in 2008) on stage as Cosmo Brown. I don’t think there’s anything that man can’t do in a pair of tap shoes. 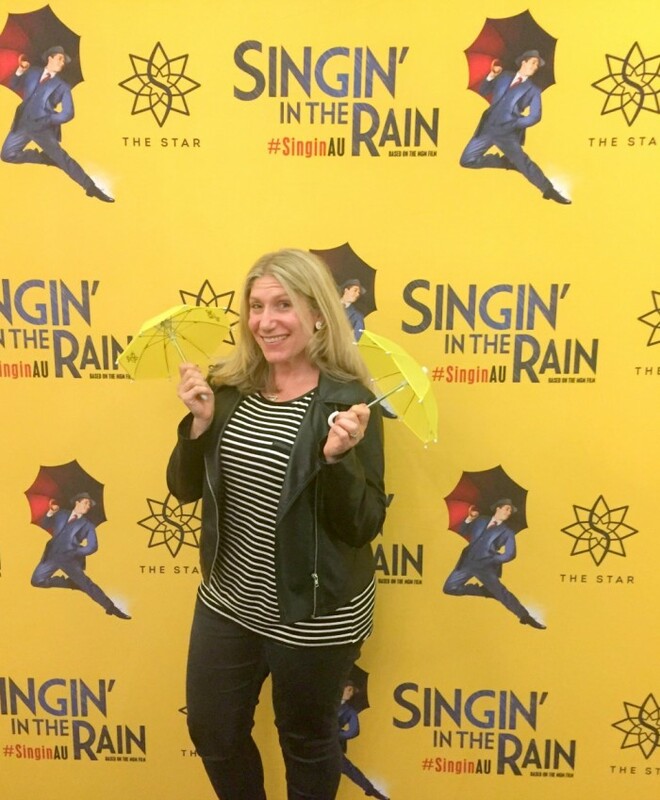 Every stage spectacular has a leading lady but “Singin’ in the Rain” goes one step further. The show has not one, but two leading ladies and they’re both absolutely fabulous! Gretel Scarlett’s performance as Kathy Selden hits all the right spots and Erika Heynatz as Lina Lamont totally steals the show. Plus their costumes were divine! I wish I could teleport myself back to the twenties for an extreme makeover! It’s not just the singing and the dancing that’s live. Even the rain is live too! It rains twice during the show, which tots up to 12,000 litres of water for each performance but don’t worry it’s all recycled! The first three rows are classified as the splash-zone for good reason. If you sit in those front rows, you’ll be given a rain poncho and you better hope that the wet look is in because the cast knows how to splash like a boss! The show is unforgettable but if you want a little extra to remember it by, be sure to score a snap in front of one of the backdrops. Friendly staff are on hand to lend you a baby brolly and/or to take your photo. 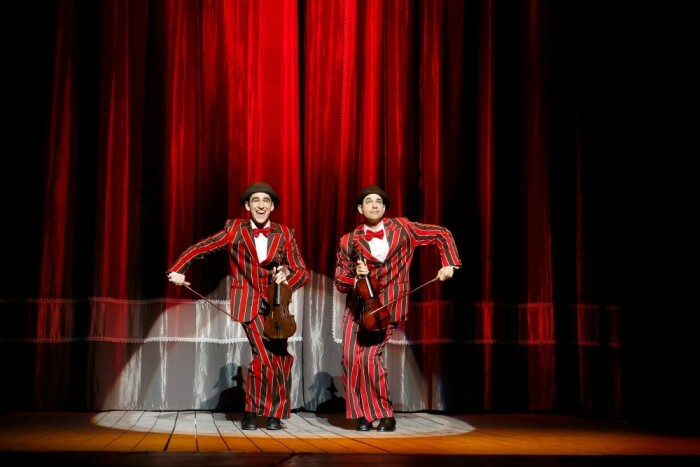 Best of all, if you hashtag and tag your pics with #singinau @sydneylyric and @singinau – you’ll get your photo printed for free! 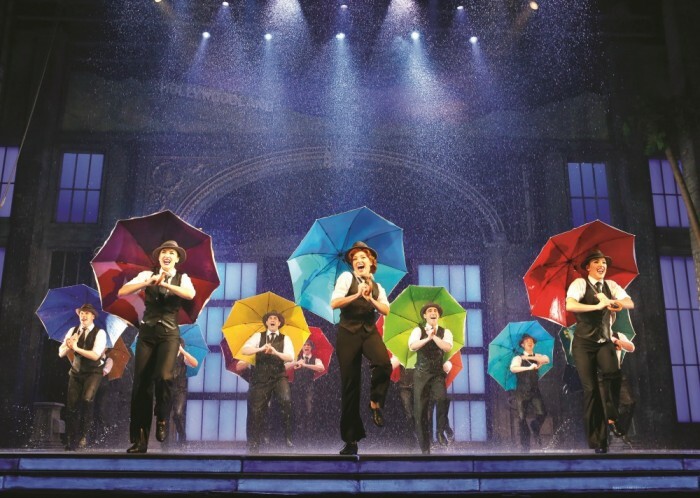 With the feel good story, glorious costumes and toe tapping choreography, “Singin’ in the Rain” is a real brolly twirler. It’s enough to make you do a rain dance so that you too can jump up on lamp posts, splash in puddles and sing in the rain! What are you waiting for? Grab your brolly! You’re in for a splashing good time! 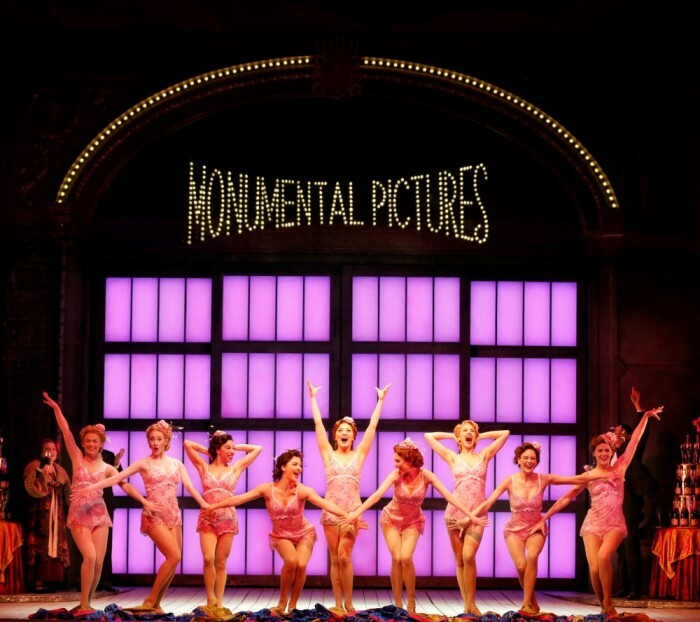 Singin’ in the Rain is on now at the Lyric Theatre, Sydney. Are you a musical fan too? What was the last show you saw on stage? Let’s talk Hollywood classics – have you got a favuorite?